For those in the medical field, the term bloodborne pathogens is likely a familiar one, but if not, it’s critical to understand just what type of pathogens these are and the dangers they represent. Pathogens that are bloodborne are viruses, bacteria, parasites and other microorganisms that are found in the blood. These pathogens are responsible for causing some of the most dangerous diseases and can cause illness in humans as well as animals. Read on to learn about how they are transmitted and preventing accidental exposure. Viruses are the most common bloodborne pathogen and this category includes everything from the common cold to more serious viruses such as HIV. Hepatitis B and C are also bloodborne pathogens in the virus category. Parasites are bloodborne pathogens that can live in your body feeding off nutrients in your blood. These tiny microorganisms can thrive and grow, affecting the health of the host’s body and in some cases causing death. One well-known parasite is malaria, although it isn’t too common in the United States, it can still be found in many other countries. Bacteria are another bloodborne pathogen that can pose a serious risk to one’s health. We’ve all heard of MRSA and E.coli, but there are many other bacteria out there that are often spread through blood transfusions, needle sticks, abrasions and more. 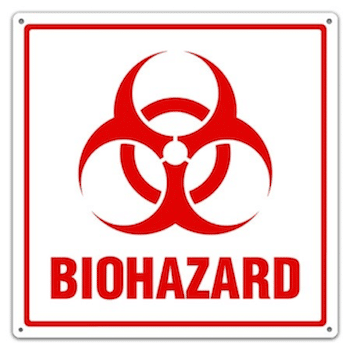 Understanding what bloodborne pathogens are, how they are spread and the dangers they represent is key to ensuring that you are not exposing yourself, your team or the community to these harmful organisms. Be sure that you offer continued training to employees on how to handle any medical waste in your facility, including disposal. Partner with us at All Points Medical Waste for all of your medical waste disposal needs—our highly trained staff is committed to serving you and helping minimizing risk. We’re a family owned and operated company that is OSHA, DOT, Health Department and HIPAA compliant. Give us a call today to learn more or request a quote.